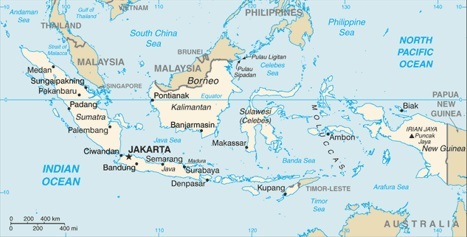 The Republic of Indonesia (Indonesian: Republik Indonesia) is a country located in Southeast Asia and Oceania. It stretches across the Indonesian archipelago of islands, includes most of the island of Borneo (which it shares with Brunei and Malaysia, and the western half of the island of New Guinea (which it shares with Papua New Guinea). It has land borders with Malaysia, Papua New Guinea, and Timor-Leste. As of 2009, Indonesia had an estimated population of 229,965,000. The capital and largest city, Jakarta, as of 2008, had a population of about 8.5 million it the city itself, and more than 24 million people in total in the city and surrounding metropolitan area. Insight Guide Indonesia is an essential guide to one of the world's last tourism frontiers, a far-flung archipelago of rainforests, volcanoes, vivid festivals and teeming cities, all brought to life through evocative photography. Our inspirational Best of Indonesia section highlights the unmissable sights and experiences, while a comprehensive Travel Tips section gives you all the practical information you need to plan your trip. Colourful magazine-style features offer a unique insight into the incomparable Balinese festivals, unique Sulawesi wildlife and colourful batik fabrics. A detailed Places section, with full-colour maps cross-referenced to the text, guides you from the jungles of darkest Borneo to the beaches of Bali, the ancient trading ports of Java and the spice islands to the primeval Papuan highlands. Insight Guide Indonesia now includes the Walking Eye app, free to download to smartphones and tablets on purchase of the book. The Indonesia app includes our independent selection of the best hotels and restaurants, plus activity, event and shopping listings. The Perfect Choice: Lonely Planet Bali & Lombok, our most comprehensive guide to Bali & Lombok, is perfect for both exploring top sights and taking roads less travelled. Looking for more coverage? Check out Lonely Planet Indonesia guide for a comprehensive look at what the whole country has to offer. Looking for a guide focused only on Bali? Check out Lonely Planet Pocket Bali, a handy-sized guide focused on the can't-miss sights for a quick trip. DK Eyewitness Travel Guide: Bali and Lombok takes you by the hand, leading you straight to the best attractions the region has to offer. DK's insider travel tips and essential local information will help you discover the best of these two beguiling islands of Indonesia, whether you want to explore local festivals and markets, trek up Gunung Rinjani, immerse yourself in the traditional culture in Ubud, or relax on pristine tropical beaches. Discover DK Eyewitness Travel Guide: Bali and Lombok. • Hundreds of full-color photographs. With hundreds of full-color photographs, hand-drawn illustrations, and custom maps that illuminate every page, DK Eyewitness Travel Guide: Bali and Lombok truly shows you this region as no one else can. Lonely Planet Indonesia is your passport to all the most relevant and up-to-date advice on what to see, what to skip, and what hidden discoveries await you. Marvel at the world's largest lizard - the Komodo Dragon, hop on a fast boat to the Gili Islands, or enjoy a Balinese dance performance; all with your trusted travel companion. Get to the heart of Indonesia and begin your journey now! The Perfect Choice: Lonely Planet Indonesia, our most comprehensive guide to Indonesia, is perfect for those planning to both explore the top sights and take the road less travelled. Looking for a guide focused on Bali and Lombok? Check out Lonely Planet's Bali & Lombok guide for a comprehensive look at all that each of these islands has to offer, or Lonely Planet's Pocket Bali, a handy-sized guide focused on the can't-miss sights for a quick trip. Authors: Written and researched by Lonely Planet, Ryan Ver Berkmoes, Brett Atkinson, Celeste Brash, Stuart Butler, John Noble, Adam Skolnick, Iain Stewart, and Paul Stiles.